[Asheville City Council member] Cecil Bothwell’s leaving the Democratic Party because he is a Bernie Sanders supporter seems to echo his candidate’s behavior. Bernie Sanders was not a Democrat prior to his running for president. He has said he will identify as an independent when he returns to the Senate. Then, why did he run to be the Democratic Party’s nominee for president? He used the power of the Democratic Party to help him to raise money, to get publicity and to be part of the mainstream, politically. That use of the one of the two major, established political parties seems to contradict his constant assertion that he is a revolutionary. Since he has not given decades of loyalty to and support of the Democratic Party, why should the party give him total support and loyalty? He was clearly using the party for what it could do for him without his having done anything for the party. While he touts having brought thousands of new voters to the party, the behavior of his independent supporters throughout the Democratic National Convention shows that he did not bring more people to the party. He used the power of the party to bring more voters to himself. Therefore, for Sanders’ supporters to abandon the Democratic Party because he is not its nominee really makes no sense. He has never been a Democrat and apparently will not be a Democrat in the future. I hope that if their failure to support the Democratic nominee results in a Trump presidency, the Sanders supporters will be happy with the results of their revenge. Isn’t this the most bizarre election cycle? Here’s the mistake I think many voters make: they believe these candidates are genuine. I assert that is a BIG question mark. Bernie certainly revealed alot many months ago when claiming at a debate, “we’ve heard enough about the emails”, with HRC immediately nodding her head continuously as if she had prior knowledge he would be saying it. He either is a dupe or got royally BS’d because as has since been made plain —there was plenty more to know about the emails, illegal server, etc! So, he’s either very dense to not realize she was going to play him like a fiddle or he’s in on the scam and is angling for a cabinet post. Whichever it is, it disqualifies him for one. What a circus! should have such GUTS, but they are WAY more indoctrinated to the ‘crackkk CONTROL and enjoy being elected criminals. That is a stupid thing to say. Historically it was true but the bigots and kkk’ers left the Democratic Party for the GOP in the sixties. You should know that. Cecil Bothwell is just now discovering that the Democratic Party is a core element of the established order? Even if this is somehow a new revelation to him, that does not mean that one should no longer use common sense and vote strategically. 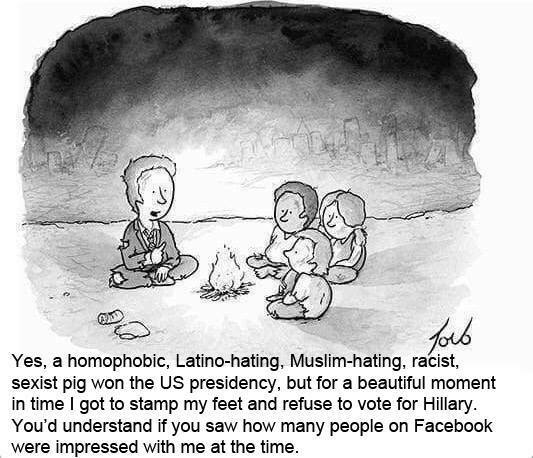 Does the following cartoon remind us of anyone?